Congratulations to the JMS Awesome Attendance students for Semester 1. 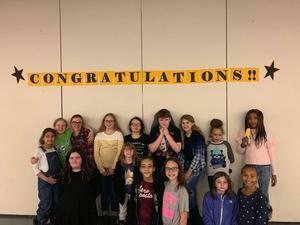 These students had perfect attendance for the first 90 days of school and were treated to a catered lunch provided by Nutrition Inc.
Family Steam Night at Johnstown Elementary was a great success. Thanks to all of the families who braved the weather conditions to attend. In this picture, one of our students is teaching Superintendent Amy Arcurio about tension and showing off his robot. 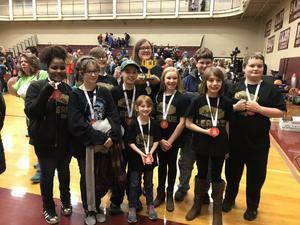 Congratulations to Johnstown Middle School, team Black, who walked away with the Judge's Award! The Johnstown High School Interact Club is participating in it's Read, Return, Repeat Program. Currently, they are looking for donations of books for all ages, especially primary books, that they can distribute. If you are interested in donating gently used books, or to make a monetary donation, please see one of the officers, or donations can be dropped off at any of the District locations. 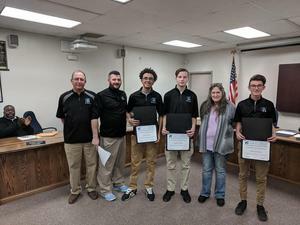 Johnstown High School students were recognized at the Board Meeting, December 4, 2018, for their community service and being nominated for the Point Stadium Award.